BEIJING, China (CNN) -- The latest unrest in western China has left five people dead and 14 hurt, a deputy mayor said Friday. 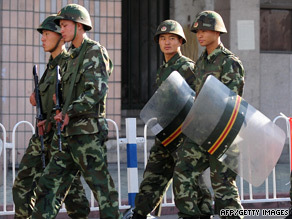 Chinese troops have been deployed on the streets of Urumqi for the past few weeks. The deaths and injuries were in the city of Urumqi, said Zhang Hong, the city's deputy mayor. Demonstrators have clashed with police in Urumqi for two days amid a strange string of syringe stabbings. Some Han Chinese demonstrators have taken to the streets to demand better police protection and a crackdown on ethnic Uyghurs, who are blamed for the attacks. Police fired tear gas on demonstrators Friday, a CNN affiliate reported. Armed security forces faced down protesters in front of Chinese Communist Party offices and later in a public square, according to Hong Kong-based i-CABLE. The state-run Xinhua news agency reported a heavy security presence Friday and helicopters hovering over Urumqi, the capital of China's Xinjiang Uyghur Autonomous Region. People were stocking up groceries for fear of escalating violence, Xinhua said. Urumqi has been plagued by violence between Han Chinese and Uyghurs since July, when long-simmering ethnic tensions erupted into riots. The Han Chinese are the country's dominant ethnic group; the Uyghurs are a Turkic-speaking Muslim minority who consider Xinjiang their homeland. Unconfirmed reports of deaths in those riots range from 200 to many more. "Authorities have issued arrest warrants to 196 suspects and prosecuted 51 for involvement" in a July 5 riot, Xinhua reported. In recent weeks, hundreds of people from several ethnic groups have sought treatment for syringe stabbings by Uyghurs, Xinhua reported. "Hospitals in Urumqi are treating 531 victims of hypodermic needle attacks," the state-run news agency said Friday, citing local police. "Statistics from the city's 24 hospitals say 106 of the 531 were showing obvious signs of needle attacks. The victims include members of ethnic groups such as Han, Uygurand Kazakstan. " There have been no reports of deaths from the stabbings. Authorities have detained 21 suspects, "of whom six are in custody and four have been arrested for criminal prosecution, said the regional information office in a mobile phone text message to the public Thursday," Xinhua reported. The syringe attacks, which residents said began in early August, sparked the latest unrest. "I heard that today, even during the protest, some people got stabbed, too," a bank receptionist, who was afraid to identify herself, said Thursday. "People are angry that the government is not doing much against the Uyghurs' needle stabbing." Another woman said the stabbings were ethnically motivated and that government text messages to citizens have warned that the syringes contained an unknown disease. Fears were likely heightened by the fact that Xinjiang has the highest rates of HIV infection in China, attributed to intravenous drug use. Rumors have abounded there of people trying to spread AIDS. According to the Central Asia Caucasus Institute at Johns Hopkins University in Maryland, Xinjiang serves as a convenient drug-trafficking route, lying between opium-growing regions of Afghanistan and southeast Asia and the heroin markets in central Asia, Russia and Europe. It is estimated that more than 60,000 people in Xinjiang are HIV-positive. The Uyghur American Association issued a statement late Thursday urging the Chinese government to improve public safety. "I call on Chinese officials to guarantee the security of all people living in East Turkestan (Xinjiang), including Uyghurs and Han Chinese," said exiled Uyghur activist Rebiya Kadeer, whom the Chinese government has blamed for inciting the strife in July.